“The Atayal ethnic group” is a general term for a complicated ethnic concept which does not equate to a group with a single language, culture or even ethnicity. On the contrary, the so-called “Atayal ethnic group” consists of many groups with different languages, diverse customs and multiple identities. These groups share common features in some cultural categories and display different features in other aspects. 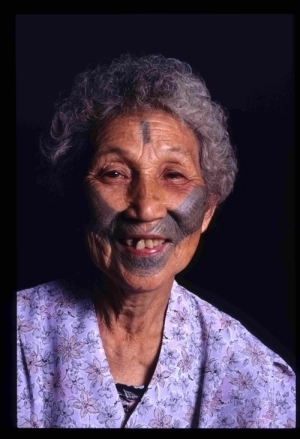 In the past, due to their unique facial tattooing custom, other ethnic groups easily recognized the Atayal as an “ethnic group.” In linguistic academic circles, scholars traditionally divided the main “Tayal ethnic group” into two language groups / sub-tribes: the Atayal and Sedek. 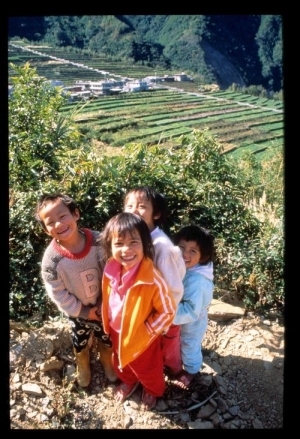 The Atayal language group is divided into the Tseole and Sekilek dialect groups. Linguist Raleigh Ferrell has taken some frequent daily phrases of these two groups as a basis for comparing their degree of difference, and he found that the percentage of similarity between the Tseole and Sekilek languages was as high as 37%, and for the Sekilek and Sedek, it even reached 46%. The result shows that the Atayal and the Sedek languages are strikingly similar. However, these two sub-groups cannot communicate by using their languages. The name “Tayal” originally indicated the group with the largest population among the entire “Tayal” ethnic group, which includes the Sekolek and Tseole groups under the Atayal sub-tribe, and means “people who use the same Atayal language and have common cultural features, such as facial tattoos and places of origin.” But in different dialects, the term “Tayal” has different pronunciations, such as Atayal, Tayal, Tayen or Tayan. “Tayal” has long been applied to both the Atayal sub-tribe and the Sedek sub-tribe. However, no matter whether the term is Tayal, Atayal, Tayen or Tayan, it is not a term of self-address for the Sedek sub-tribe. 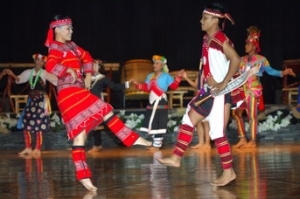 Generally speaking, the Atayal regional groups or dialect groups usually call themselves by the name of their pan-tribal alliance (Qutux p’haban). The pan-tribal alliance is composed of several tribal alliances (Qutux pinkyalan) and the tribal alliances are formed on the basis of river drainage area, region, myth of origin place, consanguine clan or blood tie worship group (Qutux gaga). The blood tie worship group is a group of blood related people participating in the same worship, obeying the same custom laws and taboos and treating the group as their main social organization and source of identity. Qutux means “one,” which implies “united as one and grouped under an agreement.” For example, Pinsbugan is one place of origin, which contains two smaller areas called Makanazi and Maliba. There were five groups that moved out from Makanazi, including the Sagalu and Kinazi group, so the people address themselves according to the group they belong to, such as Sagalu or Kinazi. Another five groups moved out from Maliba, including the Gogan and Talanan groups; thus, the members of these groups call themselves Gogan or Talanan. These groups were spread out widely, and were made up of various tribes. They usually viewed other groups as enemies and hunted their heads. Turning to the other sub-tribe of the Atayal, the Sedek, one notes that Sedek means “human being” in their language, and has been translated into Chinese as “sedeq.” Some members have begun using this term as a form of self-address now, and the sub-tribe has recently been called by this name by others, as well. 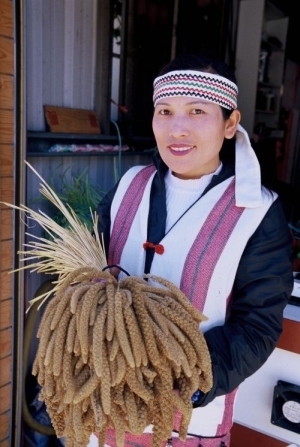 Due to increasing ethnic consciousness in recent years, some dialect groups have moved to separate from the “Atayal ethnic group” and become independent ethnic groups. 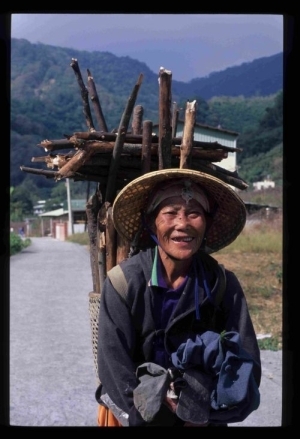 In 2004, upon the insistence of the Truku people in eastern Taiwan, the Executive Yuan recognized the “Truku” ethnic group as the twelfth group of Taiwan aborigines. 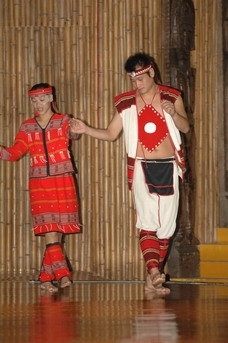 The Atayal are distributed throughout a vast area, which has given rise to different languages and customs among different tribes or groups, generated from different places of origin and by geographical barriers, which has lead to the formation of a unique concept of ethnicity. Since the period of Japanese rule (1895-1945), scholars have repeatedly attempted to use the criteria of language, culture and geographic distribution to categorize the Atayal. 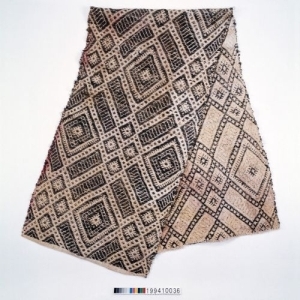 But the complicated relations among the Atayal groups have hindered their work; therefore, the classification of the Atayal has been continuously modified throughout the entire century. This fact also reveals the complexity of the Atayal ethnic system and the difficulty of defining its ethnic borders. Study” , Utzukawa classified the Atayal group into branches based on their places of origin: Pinsbukan, Papakwaga and Bunohon. These branches are called the Sekolek, Tseole and Sedek sub-tribes. In the fourteenth year of the Showa period (1939), Tadao Kano proposed a multilayer classification that resembled Asai Erin’s. However, Kano’s classification is more complete, because he not only considered broad criteria such as language, customs and physiology, but also created a hierarchical system of organization, from the largest, “Tribe,” to “Sub-Tribe,” “Group” and, the smallest, “Village.” After World War Two, Hwei-Lin Wei proposed a new multilayer classification in Taiwan sheng tong-zhi: tong zhou zhi General Report on Taiwan Province, where he divided the Atayal into two sub-tribes, which included two groups in each sub-tribe. Wei adopted race, language, culture, geography, history and social relations as criteria to divide the Atayal sub-tribe into Sekolea and Tseole groups and the Sedek sub-tribe into East Sedek and West Sedek groups. 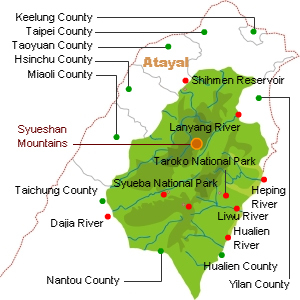 In addition to this classification, Wei proposed another classification in Taiwan tu-zhu ge-zhu fen-buThe Distribution of Taiwan Aborigines, which uses the river drainage areas where the Atayal tribes are located as the criteria for classification. In this book, Wei distinguished the following river drainage areas into separate classifying units: Beigang River (in Nantao), Dajia River, Dajhuoshuei River (in Nan-ao, Yilan County), Dakekan River, Houlong River, Da-an River, Dajia River, Jhuoshuei River, Dajili River (also known as the Liwu River) and Mugua River. It is a unique classification which can efficiently explain the distribution of the Atayal. However, several groups residing in the same river drainage area can easily give rise to confusion. For example, the Sitomot, Hehuan, Malikoan and Kanaji groups of the Sedek sub-tribe are all located in the upper Dakekan River area. This classification became more unreliable after the large scale forced migration of Atayal tribes beginning in the mid Taisho period (1920) during the Japanese colonial period. Shou-Chen Liao‘s book “T'ai ya tsu te wen hua” (The Atayal’s Culture, 1984), proposes another multilayer classification. Liao’s classification mainly adopts the classifications made by Tadao Kano, Utzukawa and Hwei-Lin Wei. The most significant feature of Liao’s classification is its clear kinship relations among different groups: he divides the Atayal sub-tribe into the Sekolea and Tseole groups, then into branches in these two groups based on individual origin myths, and finally distinguishes sub-branches by consanguine clans and geographical distribution. In the origin myths, three Sekolea branches, Makanaji, Malepa and Malikoan, originate from Pinsbukan (current Fasiiang Village, Renai Township, Nantou County), while four Tseole branches, Maba-ala, Mapanox, Menebo and Marerax, originate from Papakawaka (currently Dabajiian Mountain). 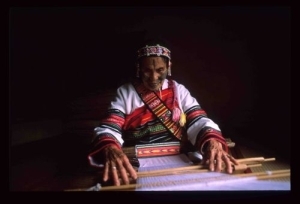 An Atayal female not only had to perform everyday chores such as feeding the pigs, growing millet and sweet potatoes, doing laundry, and cooking the meals; she was also expected to know ramie cutting, yarn spinning, dyeing, warping, and fabric weaving before she could be considered a good daughter-in-law and a beauty acknowledged by the spirits of the ancestors. In traditional weaving technique, the most basic skill was using blinding of single thread and color threads to create long straight lines or short crossing twill lines, which generally kept vertical. The delicate patterns usually came from a variety of different diamond designs; including overlapping the ramie threads of various colors to develop different diamond shapes or weaving a decorative design inside a large diamond pattern. Red, yellow, pink and light green were the main colors with less blue, purple and black. White ramie was the principal material. When dyeing was needed, the pigments were normally taken from natural sources. 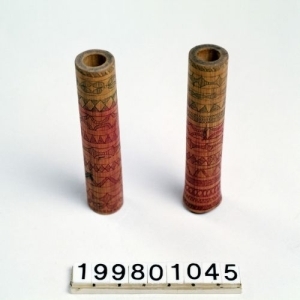 In the past, the Atayal people were nicknamed “the barbarians with tattooed-face.” The most important meaning of face tattooing was to differentiate the Atayals from other tribes. A newborn boy or girl would have a tattoo at forehead. It signified that the baby was a human, not an animal. At teenage, when a girl had her first period, cheek tattoos were added to her face. For a boy, after passing the headhunting test, a tattoo would be affixed below his lower lip. 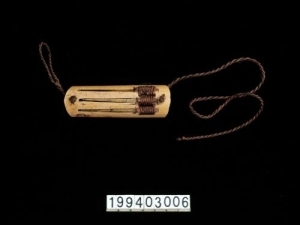 After Japanese occupation of Taiwan, a male could have a tattoo addition after he returned from a headhunting excursion even if he was just carrying a head that someone else had hunted or if his father or elder brother had scored. A man without tattoos was considered a coward and despised. He would not be awarded the test of crossing the rainbow bridge after he died. A virgin girl which was good at weaving would be blessed by Utux. Meanwhile, having a beautiful tattooed face could not only be a beautiful woman that all men desired, but could also cross the rainbow bridge after died. She would be the perfect woman in the eye of the tribesmen.